and relates any information and comments about them. Welcome, faithful readers (and those of you joining us for the first time) to the latest installment of Cover Stories, the weekly column in which I, Jon B. Knutson, present a group of covers with a common theme! This week's theme is "Clichés," and it's probably the most ill-defined theme I cover here! But I'll try to capsulate it here: A "cliché" cover is any cover that depicts some kind of cliché, but not one specific to comics themselves. Now, I don't often feature two covers side-by-side here, unless I'm doing a "1-10" feature, but I thought this time, I'd make an exception! 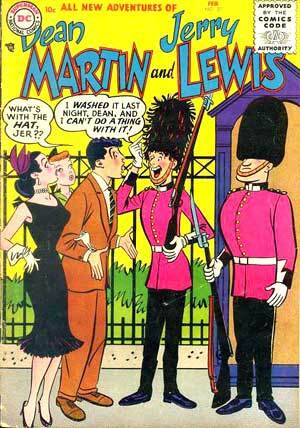 DC had two long-running comic books based on movie comedians... The Adventures of Bob Hope (which you can see issue 26's cover above on the left) and The Adventures of Dean Martin and Jerry Lewis (which changed to The Adventures of Jerry Lewis after the team broke up... and that's issue 27 of that title on the right). I find it very interesting and amusing that both titles used the same punch line on their covers, with issue numbers that were so close together! Of course, these two books didn't come out at the same time! For those of you who are perhaps too young, there was a commercial or advertisement that was running about this time, which featured a woman looking upset, and being asked what was wrong with her hair, and the response was "I washed it last night, and can't do a thing with it!" Just like Bob and Jerry there! And no, I don't recall what the product was. Or maybe it was from a movie. Anyway, the line became a pretty popular punch line, as can be seen here (and even on the net today, you'll see people using it as a punch line!). So far as what's inside these two books, or credits goes... unfortunately, the Grand Comics Database falls way short there, but it's probably not too far a stretch to guess that Bob Oksner did the art for one or both of these covers. How about a different cliché gag? 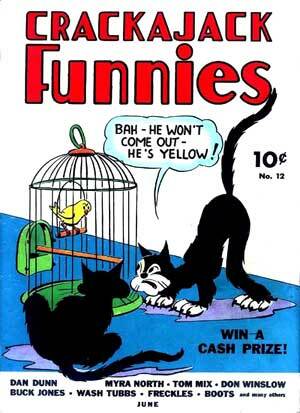 Crackajack Funnies #12, pictured above, features probably the lamest cliché gag you'll ever see me feature here! No credits available for this cover art... and inside, all I can tell you is that there were stories featuring Don Winslow, Wash Tubbs, Dan Dunn, Speed Bolton Air Ace, Freckles and His Friends, Myra North, Apple Mary and Dennie, The Nebbs, Clyde Beatty, Tom Mix, Boots, Ed Tracer G-Man X32, Buck Jones, Annibelle, and Red Ryder... most, if not all, reprinted from newspaper strips, I'd imagine! 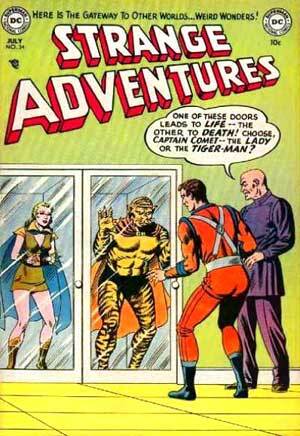 Here's a different kind of cliché entirely... for Captain Comet, here on the cover of Strange Adventures #34, is facing the traditional "Lady or the Tiger" choice... and if this plot device hasn't been used more often than the plot of "The Most Dangerous Game," I'd be surprised - it was even used in an episode of the 1960s Batman TV series! At last having a Tiger-Man gives it a unique twist. 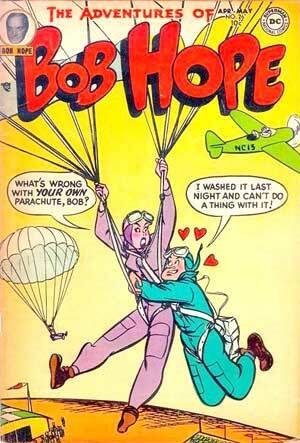 This cover was by Murphy Anderson. Inside, we have Captain Comet in "The Lady or the Tiger-Man" by John Broome and Anderson, reprinted in Superman #244; "30th Century Coin Collector" by Sid Gerson, Carmine Infantino and Sy Barry; "The Space Hermit" by Gerson and Henry Sharp, reprinted in From Beyond the Unknown #3; and "The Star Oscar," by Gerson and Frank Giacoia, reprinted in Strange Adventures #220. 09/30/2007 Installment 125: 1-10 - Challengers of the Unknown! 09/23/2007 Installment 124: Ch-ch-ch-changes - And it's all Superman family titles! 09/09/2007 Installment 122: Reader Challenge - a reader gave me four comic book covers, and challenged me to come up with the theme! 08/19/2007 Installment 119: 1-10 - Captain Marvel Adventures! 08/12/2007 Installment 118: Comics Never Made - Five comics that never were! 07/22/2007 Installment 116: A G-g-g-g-g-ghost!